Visitging the city of dreams – Dubai. 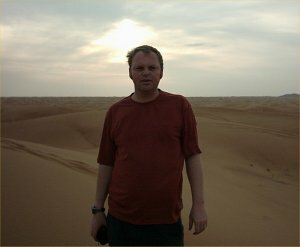 I had heard many exciting things about Dubai. Since our flight home passed there, we decided on a 2 day visit. We were collected from the airport at 5:30am. It was nearing the end of our 3 week trip, so we were exhausted. After a few hours rest, we headed into the city to explore. 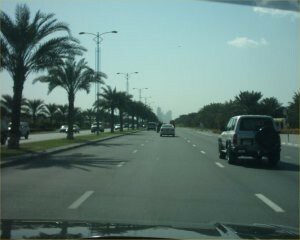 As we drive down the main highway into the city, the sun is in the sky and music is belting out of the stereo. The Winter temperature of between 14 and 28 was very agreeable considering how cold it would be back home. The famous Dubai creek, which separates both sides of the city. 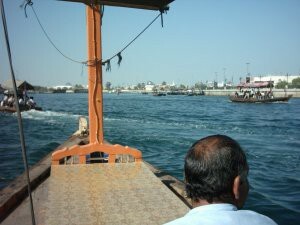 Its here that the dhows, travel from across the Arabian sea, moor up, next to the creek, and trade goods. The goods are then sold at the market next to the Creek (in times gone by, they were spices, but now, they are more likely to be colour televisions). 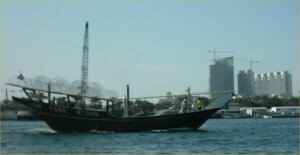 We charter a dhow, and travel across the creek. As I take my seat I’m overtaken by the moment. Arabian Sailors have travelled vast oceans in boats like these, long before the birth of Christ. We pass some of the larger trading ships on the Creek. Dubai’s historic roots, make its present day status all the more interesting. The country is only the size of Essex. It had, No school until the 1950’s, No electricity until the 1960’s, and its first hotel was built in the 1970’s. The education system has certainly caught up. Our hosts son went to school in Dubai, and had learned English there. He spoke English, the way a concert pianist plays the Piano, it was a delight to hear. 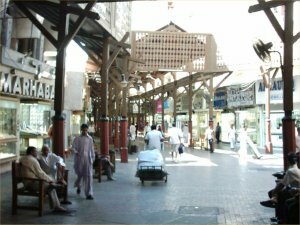 Once we reach the other side of the Creek, we disembark, and wander around the old town, visiting some of remaining few traditional Souk’s (Markets). Here we wander around the spice Souk. 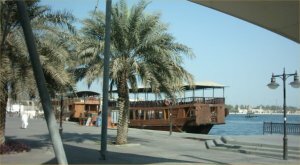 Everybody says Dubai is expensive (pints of lager in an ordinary pub are £5-£10) but a trip back across the Creek, on a public dhow, cost only 30p. Today, 1.2% of Dubai residents are dollar millionaires and among its many accolades the most elaborate hotel in the world, the tallest building and a ski-slope in the desert ! 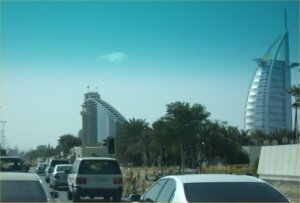 We head off exploring again, and pass the Burj Al Arab, the only 7 star hotel in the world. Located on a man made Island and at 300m high, the tallest hotel in the world. It features entire floor size suites, each with its own reception and full compliment of servants. Taking security to extremes, they actually have a tactical force (like a swat team) which you can hire. They also sell the famous Coffee from CSI, made in Japan, it sells for £90 per lb. Further on, we pass the Knowledge Village, and Internet City, entire building complexes housing some of the largest technology companies in the world. We have lunch in the Mariner. 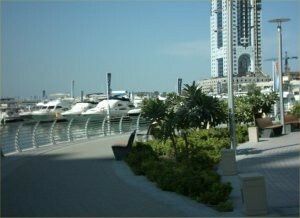 Tens of thousands of new properties are being built in the area, as it is estimated that 10 million Europeans will live in Dubai by 2010. This doesn’t surprise me, its spotlessly clean, and secure – a lone woman can walk around safely, at nearly any time of the day or night. 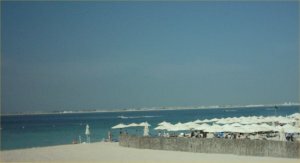 A bit hard see from this picture, but this is the palm Island resort, taken from the Mariner. It’s man made, and from the sky looks like a palm tree. The idea, is that the Palm Tree shape, provides a much larger waterfront area, than a normal “round” island. To illustrate the lengths the designers are going to, planes are actually being sunk around here, so people who enjoy diving as a hobby have something to explore. The next idea is the world island project, which involves hundreds of man made islands, in the shape of each country. Once you own the island, you can build whatever you want on it. 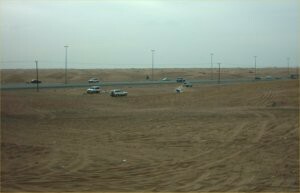 While we were there, the famous ski slope in the desert project , had been completed. 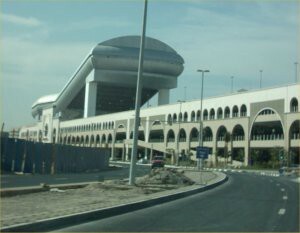 It’s located above The Mall of the Emirates shopping centre, so the cooling equipment for the snow, also air conditioned the building bellow. Once inside, it was spectacular to see. 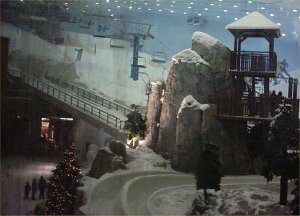 It has 5 different slopes for different levels of skiing proficiency and snow boarding. The longest run, is 400m, with a 60m fall. Dubai’s next project is a restaurant, completely underwater, that can only be reached by submarine !. We visit the site of the Burj Dubai tower (since I was there, It’s been completed and renamed the Burj Khalifi tower). Nearly 300 meters taller than the present tallest floored building in the world, the Taipei Tower in Taiwan. 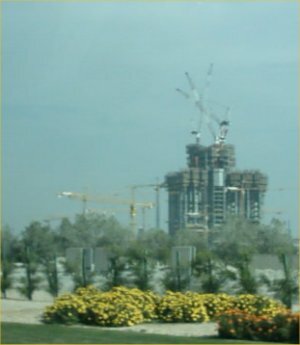 But in Dubai, how long will it be the tallest in the world ? Its design is a bit like several towers, fastened together, in order to make it wind tolerant. 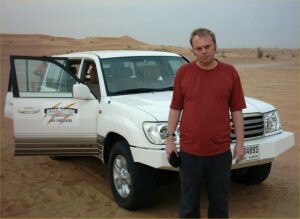 On our first evening, we go out on Safari across the Arabian Desert. Our driver was impeccably mannered and very professional. We were joined by an Australian couple and their son. 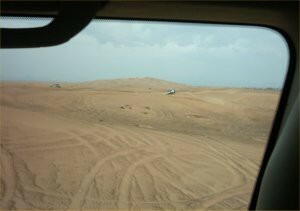 We go Dune bashing in our 4 x 4 Toyota land cruiser. Our driver was expertly trained, and could stop the vehicle, on a dune with a heavy gradient , then just as it started to slide, engage the transmission and move off at breathtaking speed. Embarrassingly, I was the only person in our Vehicle to be “separated from his lunch”, when we parked up to watch the sunset. The sunset was a bit of a disappointment, as there was little sun to see !. I thought the desert looked beautiful anyway. We visit a traditional Bedouin camp. Camel traders try to (politely) part us from our money. The bargaining skills of Arabs, are well known, but we decline the offer of a camel ride. We sit down to enjoy our evening barbecue in the desert, on Majalis (low cushions). Later, we are entertained by Mariana, a belly dancer, with significant skill. We were asked to join her, but my dancing isn’t good enough for wedding celebrations in the UK, and certainly no match for a professional dancer. Our last evening in Dubai, and have dinner at Trader Vicks. 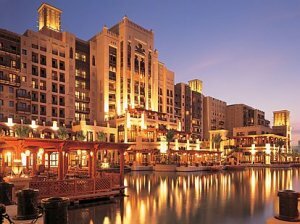 Its located in the Madinat Jumeirah hotel, which is modelled on an Arabian town, complete with market. This hotel, has a man made lake, and many of the suites on their own small island, which can be reached only by boat.